This shows the lovely transparency of the bars with the chamomile, and spices showing through. 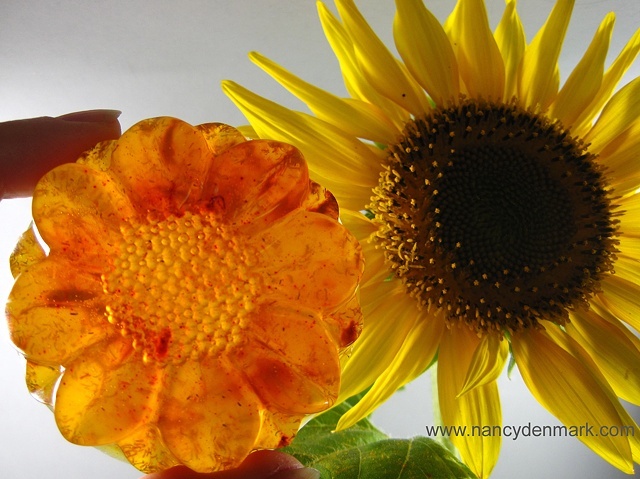 A clear glycerin, olive oil soap with essential oils of ginger and lemon that provide a fresh invigorating scent, molded in a sunflower shape. Natural color is provided by beneficial spices of turmeric and paprika. The addition of beneficial ground chamomile adds more visual interest and gives it the look of marmalade. These sizable bars are priced at $5 each.